If the Apple's flagship iPhone 7 is the most-anticipated phone in 2016, and finally it comes with various iPhone 7 pros lie in the newest iOS 10 with a stronger Siri, better backward compatibility and new keyboard, Airpods, being considered as the best phone in 2016. We'll know more at WWDC 2016. It is really exciting to get your old iPhone replaced by the shiny new iPhone 7. But how to transfer data to iPhone 7 is a big issue remaining to be resoled, especially when they want to get iOS 10 update with smoothness (iOS 11 udpate is available now). Apple's iCloud and iTunes are great iPhone 7 data transfer apps. The guide below centers on how to transfer contacts from iPhone Android phones to iPhone 7, as well as other data, like photos, text messages, videos, notes, memos, mails, etc. for iOS 10 update via iCloud and iTunes. MacX MediaTrans is an excellent iPhone 7 manager, not only allowing you to backup iPhone music, photos, videos to Mac without a hassle, but also transfer content from iPhone 6/6s/SE to new iPhone X/8/7. And thanks to the Intel QSV/Nvidia/AMD Hardware Acceleration tech, it delivers super fast speed to transfer your old iPhone data, including photos, music, videos to Mac or import files from Mac to new iPhone X/8/7. As a test shows, when we transfer photos from iPhone to Mac with a number of 100 4K Ultra HD, only 8 seconds are needed (1000 photos to computer with 30 seconds). Step 1: Prior to backing up iPhone file datas, you should free download the iPhone transfer software first. And then launch it on your Mac computer; connect your iPhone device to Mac with a USB cable. Step 2: Click the icons (Photo, Music, Video) to enter the corresponding files window. Here takes iPhone video transfer for instance. You can select single video or movie from iPhone or just hit "Select All". Step 3: Click "Export" button on the top of the panel to backup iPhone to Mac without using iTunes. Step 4: After you bought a new iPhone 7, repeat step 1 and step 2, then click "Add Music/Video" button to transfer data to new iPhone 7. Finally click "Sync" button to complete the whole old phone data to iPhone 7 transferring process. Step 1: Before you transfer data from old iPhone to new iPhone 7, backup your old iPhone data via iCloud. Open iCloud, head to Settings >iCloud > Backup, and it will automatically make a data backup for iPhone 7. Step 2: Turn off the old iDevices, and turn on iPhone 7. Go to "Set up your devices" in the Setup Assistant. 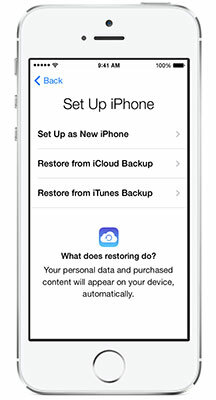 Select "Restore from iCloud Backup" and sign in to iCloud following the pop up instruction. 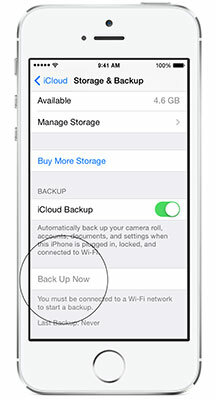 Step 3: From the list of backups, select the latest backup and tap restore. How to backup iPhone 6? Please use the same method. Tips: Wi-Fi connection is needed to transfer files to iPhone 7. It is essential to know that 5 GB is the maximum storage size for backup. So you need to free up iPhone space, for instance, delete unused apps, remove seldom watch video or music, reduce video size, clear the cache, etc to ensure the large storage size. The data transferred to iPhone 7 doesn't include music movies etc. not bought from iTunes Store and files transferred from your computer originally. Luckily, some limits will be removed if you make a switch to iTunes to transfer data from old iPhone to new iPhone 7 with iOS 10. Read on and learn how to transfer contacts from iPhone to iPhone 7 via iTunes, also photos, messages, mails, and more. Step 1: Make a backup of old iPhone data. Connect the old iPhone to computer, and open iTunes. Proceed to Choose File > Devices > Back up. Step 2: After the data backup process is done, you can move files to iPhone 7 now. Similarly, turn on iPhone 7, connect it to iTunes on your computer. Go to File > Devices > Restore from iTunes Backup. When the process of transferring data to iPhone 7 is complete, the new iDevice will restart. Note: Compared with iPhone 7 data transfer iCloud, it requires no Wifi connection to transfer data from old iPhone to new iPhone 7, but a computer is needed. There's no limits of backup storage. Selective backup though is not supported by iTunes, which means you have to backup all of your data whether you want it or not. Things are going to be more tricky when it comes to transferring files to iPhone 7 from old Android devices Samsung HTC etc. Available ways are also different to transfer different contents to new iPhone 7. Transfer app music data to from Android to iPhone 7: 1. For some apps and music streaming services, like Spotify, Pandora, that you've registered, it's simple, just download them on iPhone 7 via App Store, and log back in. 2. For other music saved on your old Android phone, you can install Android File Transfer(for Mac OS X), Android to iPhone data transfer app, and open it, head to Android File Transfer > Music. Select songs and move them to a new folder. Then open iTunes, Library > Music, open the song folder and drag it to iTunes. All the subsequent steps are similar with transferring data from old iPhone to iPhone 7. How to transfer data contacts mails photos videos from Android to iPhone 7 with iOS 9 upgrade to iOS 10: iOS 10 surely supports Google Gmail, and other providers like Yahoo, Exchange etc. 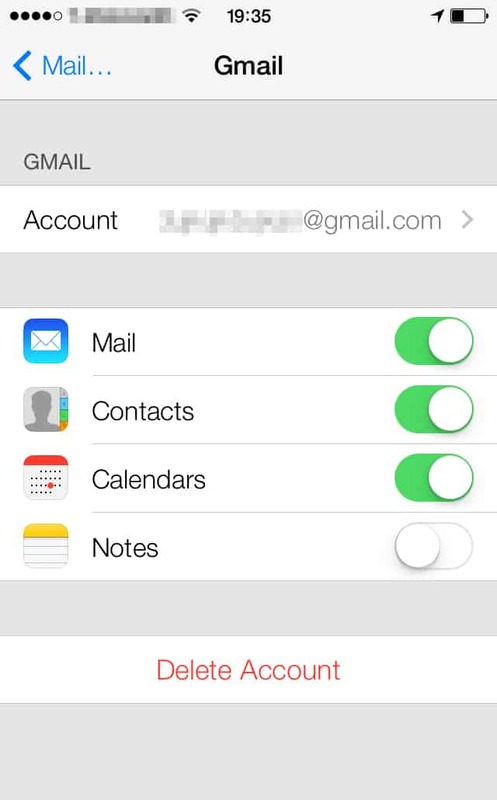 Resign in your email account, just log back in. As for photos videos, it is a straightforward solution to upload them to Facebook, Twitter, or other social media account for later data to iPhone 7 transfer. Transferred Data Video Music Won't Play on iPhone 7? Solved Here! From time to time, you may notice that the videos and music, especially you transfer from Android are unplayable on iPhone 7, as a result of format incompatability issue. So you may on the hunt for a video converter to transfer these data video in WMV, MKV, AVI, or other Android videos to iPhone 7 supported formats. 1. It converts videos of MKV, FLV, MTS, AVCHD etc. to iPhone 7 supported video formats MO4, MOV, M4V, etc with no quality loss, meaning that you can play 4K UHD videos movies/videos on iPhone 7 without any format limits. Or you can convert videos files transferred to iPhone 7 ringtone format. 2. It helps to compress large video files into smaller file to free up iPhone 7 space, see from 4K to 1080p. 3. After transferring data to iPhone 7, to enrich your new devices with more video movie resources is your next step. It downloads YouTube videos to iPhone 7 in a blazing fast speed. In fact, it is also able to download movies to iPhone 7 from vimeo, Vevo, Dailymotion, Facebook and other over 1000 sites. Free download iPhone 7 video converter on Mac or Windows platform. Follow the steps below to transfer video data to iPhone 7 formats for playback at one go. 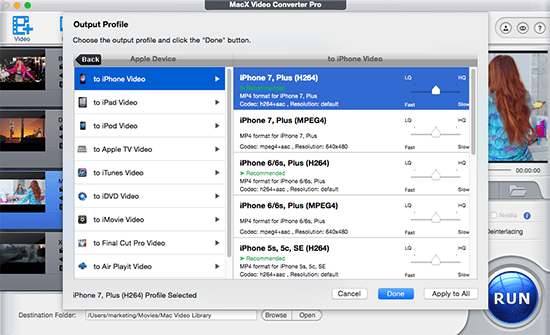 Step 1: Run the iPhone video converter and tap the "+ Video" to load the video for conversion. It supports convert multiple video files in batch. Step 2: You can choose MP4, MOV and M4V format playable on iPhone or go to the device profile Apple Device -> to iPhone video -> iPhone 7 from the drop-down window. Optionally, you can adjust the parameter settings like change the resolution from 4K to 1080p, or compress MP4 by editing, cropping, etc. Step 3: Click Browse to set the output folder and hit RUN button to start transfer video to iPhone 7. Then you can sync video to iPhone 7 for playing limitlessly.